Star Wars Celebration is a lot of things — a rolling party, a launch pad for news and announcements, the collectibles mall of your dreams — but I think of it as a beloved temporary community, one that reminds me just how fun being a Star Wars fan is and how generous fans are in sharing their passion for it. Most of the time, Star Wars is a background buzz amid the noise of normal life — a pop-culture reference, a bit of news, the sight of a stranger’s T-shirt or tattoo. But when we all come together for five days, that’s stood on its head. What would be an odd coincidence the rest of the year becomes, improbably and blissfully, the norm. You don’t bat an eye to find yourself waiting for the bathroom behind Imperial officers or Jedi Knights. An R2-D2 rolling by, tootling and beeping, just means it’s Friday. 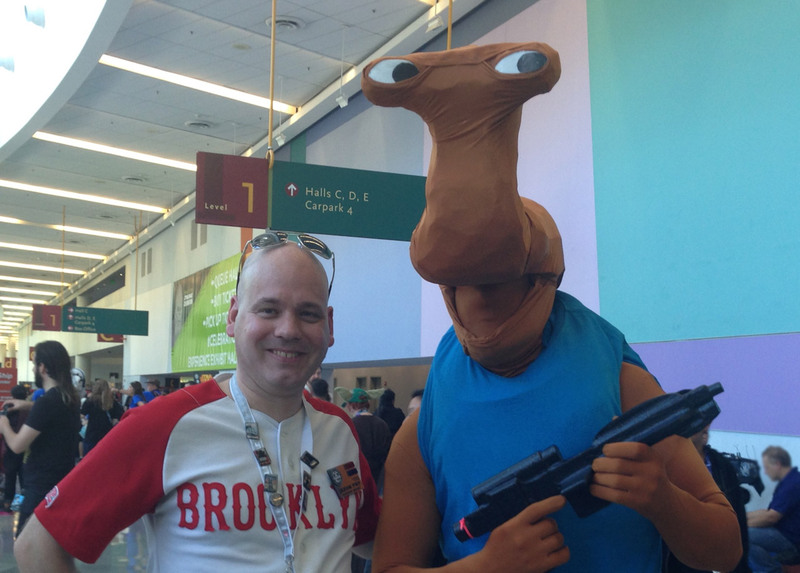 The intergalactic Benny Goodman bop of the cantina band plays on a loop and this time it’s not just in your head. And rather than having to seek out your fellow devotees, you get to geek out about Star Wars as often as you want to and with as many people as you want to. Chicago will be my sixth Celebration, but I love that I always forget all this — because it’s so much fun to be reminded. Then there’s the airport at our destination, and the hotel, and by then you’ve entered the outskirts of anti-Mos Eisley, a wonderous hive of scrums and vivacity. There are old friends to meet and new friends to make, and the unexpected will soon become part of the program. I’ve got about a million memories, but here are a few. Towards the end of Celebration London in 2016, I heard a Wookiee roar nearby while checking my text messages and barely reacted, only to realize how strange it was to hear that distinctive bellow and not think it was a big deal. I looked up and saw the source of the noise was a cosplayer standing next to me, in a very impressive Wookiee costume, checking his messages. Presumably his texts weren’t in Shyriiwook, though at Celebration you should never assume. Or there was a day in Anaheim in 2015 — at least I think it was Anaheim — where some friends and I decided to go for a walk and check out one of the giant ship props that had been constructed at one end of the exhibit hall. 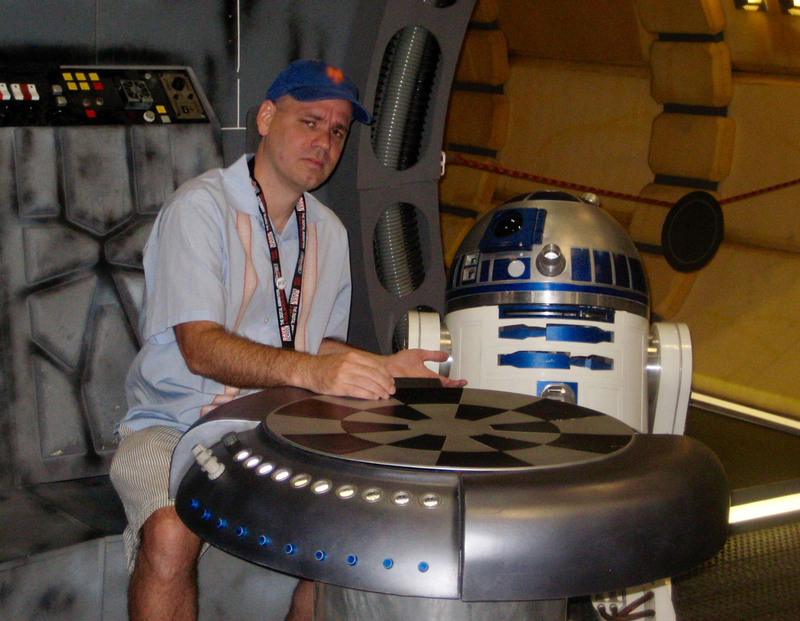 I was with my pal Chris Reiff, an amazing artist and talented droid builder, and he was controlling R2-D2, making everyone’s favorite astromech trundle alongside me. Without thinking about it — and entirely forgetting this was all Chris’s artistry — I fell into a conversation with R2-D2, who blooped and tweeted in response. 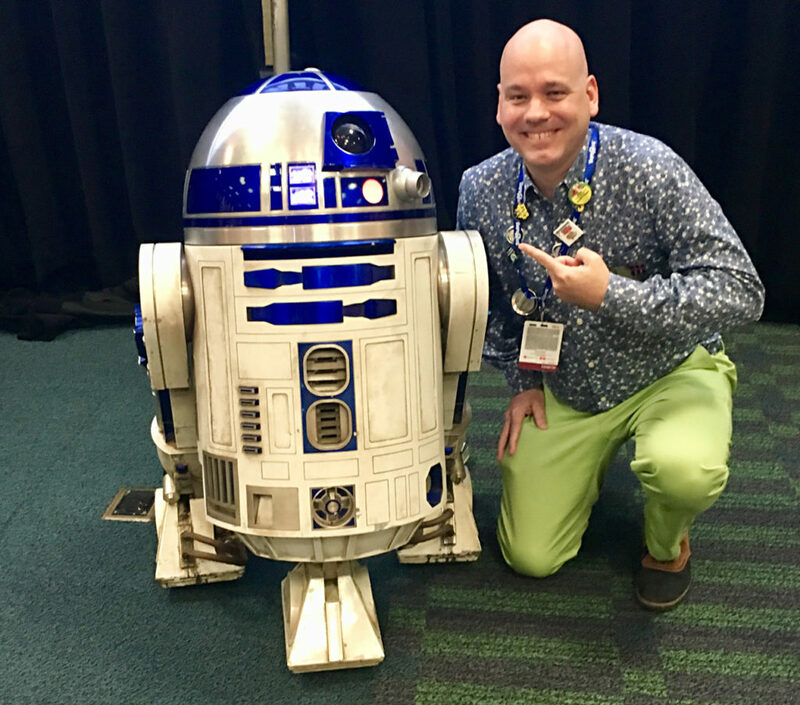 Celebration is where you can fall into conversation with R2-D2 like it’s no big thing — or with the fans around you in line for a panel or signing. (Maybe you’re not the best at small talk — I’m certainly not — but at Celebration it’s as easy as it ever will be. Start with “what Star Wars thing are you really excited about right now?” and go from there.) Celebration is where you can pose in the grip of a life-size rancor, making a goofy face, and then spot photos showing your favorite actor, filmmaker, or comic-book artist making that same goofy face — a great reminder that we’re all fans at heart. In Orlando in 2017, I was sitting with Kemp Remillard, a friend and ace illustrator with whom I’ve written Cross-Sections books for The Force Awakens and The Last Jedi. Kemp and I were waiting to be interviewed onstage, at the center of a big crowd. That didn’t make me nervous, but what did make me a bit nervous was where we were waiting: they’d parked us at a perfect reconstruction of the game table from the Millennium Falcon, and all I wanted to do was play with everything. I tried to be cool about it, failed, looked up to say something and saw the same look of giddy amazement on Kemp’s face. But here’s my favorite memory of all. In Orlando in 2010, I finished a panel and fell into an animated conversation out in the hall with a gaggle of fans. Our topic: what was the original, non-Jedi-trainee purpose of the helmet aboard the Millennium Falcon? Luke notes that with the blast shield down he can’t even see, let alone fight, and you have to admit it’s a good point. I was working on The Essential Guide to Warfare at the time and had a hypothesis about the helmet, one I wanted to field-test. After some lively conversation, I suggested we move our impromptu focus group to the nearby Hoth Bar, where a libation or two might spark creativity. Ten minutes later, we were pondering the likely mechanism of the helmet’s visor when a guy dressed as Episode IV Luke Skywalker walked in. That’s not uncommon at Celebration, but we all went quiet when we realized that under one arm he had…that exact same helmet. When we (somewhat breathlessly) explained we were up to, he was happy to hand over his headgear for closer scrutiny and offer some theories of his own. And that’s the best part of Celebration — a generosity of fandom. Ask that cosplayer how she fabricated her perfect Baze Malbus ammo belt and I bet she’ll be happy to give you some tips. Same goes for the couple with the amazing porg tattoos that are exactly what you’ve imagined for your own arm. Or, as I discovered, for the guy with the mysterious blast helmet you really needed to see up close but thought you never would. At Celebration, these encounters aren’t amazing once-in-a-lifetime coincidences, but hourly miracles. The sad part is knowing that all too soon they’ll be behind us; the happy part is remembering that before too long, we’ll get to gather again. Jason Fry is the author of more than 30 Star Wars books and short stories, including The Weapon of a Jedi, Rogue One: Rebel Dossier, The Essential Atlas, and the Star Wars: The Last Jedi novelization. 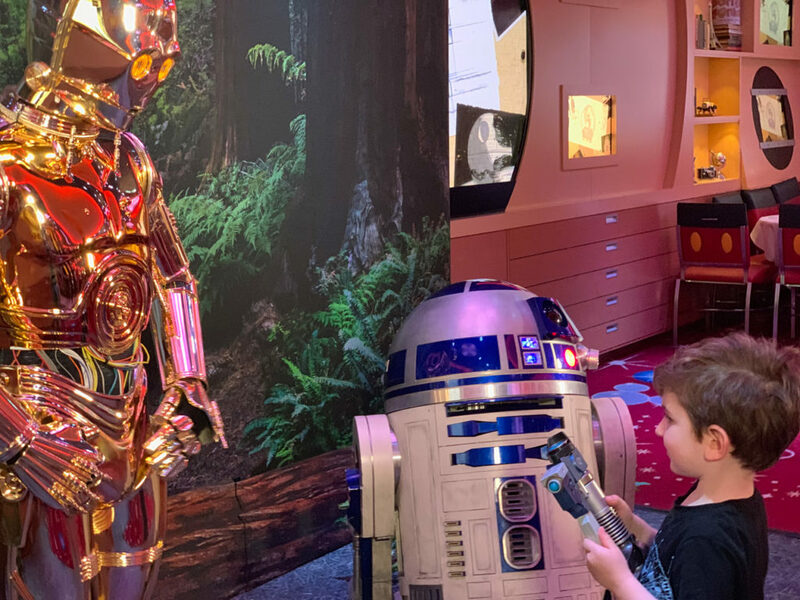 It was the evening before Star Wars Day at Sea on my family’s Disney Cruise Line vacation, and my three-year-old son Jack was scouring the Star Wars section of the main gift shop. (This “section” was, in reality, a Star Wars shop all its own.) There were Darth Vader action figures and Millennium Falcon vehicles and exclusive droid toys, and much more. In an effort to do our best impersonation of good parents, and because our Big Suitcase was perilously close to the dreaded 50 lbs. airline limit, my wife and I told him that he could buy only one thing, with the caveat that we had power of approval. This made Jack’s decision all the more difficult and important, but he was agreeable to our terms, thankfully. Like any three-year-old, Jack wanted almost everything he came across, except for toys of bad guys — he has an endearing quirk about only wanting the good guys. (Most of the time when he plays at home, the villains end up switching sides.) So we had to temper him a bit, but nothing he picked was really quite right; items were either not age appropriate (geared toward adult-collectors) or were just too big (sorry, Millennium Falcon). But then, I had a realization. The first thing Jack asked for when we went into the store was a lightsaber. His face lit up when he saw them — several buckets and a wall’s worth — but I’d said no. I was worried he might hit his younger brother, who’s just nine months old, or act like, well, a three-year-old with it. (To be fair to him, he’ll actually be four very soon.) I stopped and thought about how old I was when I began playing with Star Wars toys and received my first lightsaber. It would’ve been right around his age, and I can still remember what it meant to me. Plus, what kid experiencing something called Star Wars Day at Sea should do so without a lightsaber in hand? I conferred with my wife, who agreed. He beamed, running over to check out all the variations. 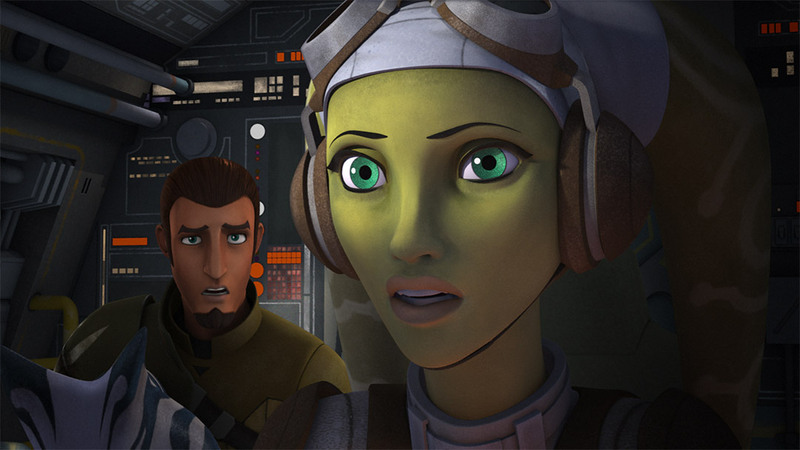 While the traditional red-, blue-, and green-bladed versions were cool, he was wide-eyed with amazement upon picking up Ezra Bridger’s lightsaber from the Star Wars Rebels animated series. The blade extended. It made sounds. It was part blaster. “I want this one!” he said. A few minutes later in our room, we freed the toy from its package and Jack ignited his first lightsaber. It was a big moment. For him, but definitely for me, too. See, a pretty amazing thing happens when you’re a Star Wars superfan and start raising a family: your relationship to the saga changes. And it changes in a rich, rewarding way. 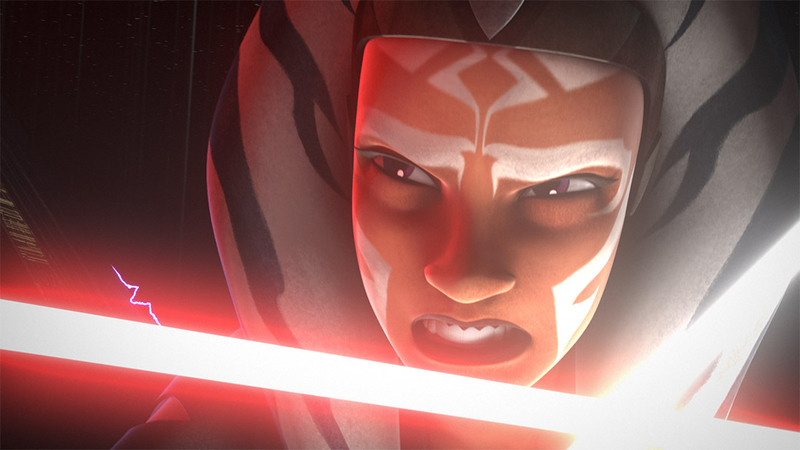 Star Wars is no longer something for me to experience on my own; it’s something for me to share and pass down. I’d never felt that more than in that moment. 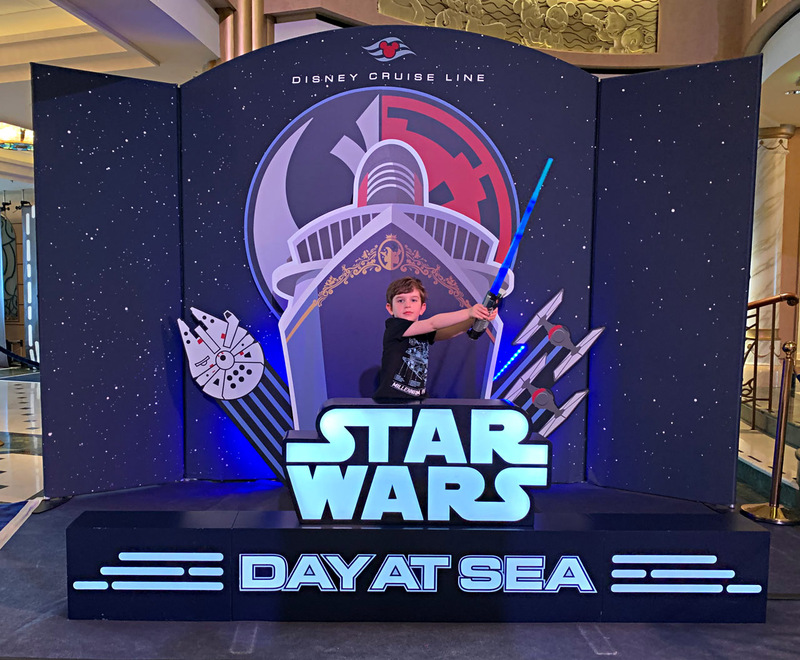 That was the really powerful and joyful thing about Jack getting his first lightsaber, and my family’s Disney Cruise Line and Star Wars Day at Sea experience overall. Our early-February trip on the Disney Fantasy, one of Disney Cruise Line’s ships, was to be a seven-day journey through the Western Caribbean. My family — my wife Jen, our sons Jack (three) and Ben (nine months), and myself — had never been on a real vacation together. In fact, Jen had never been on a cruise before, and my last cruise was 20 years ago. Traveling with kids is never easy, and the change in time zone would, we knew, impact their nap schedules and most likely their behavior. (When kids are over-tired, they act like crazed rock stars. At least mine do.) So this was a big deal, and we really didn’t know what to expect. Turns out, we needn’t have worried. Even just leading up to Star Wars Day at Sea, our trip was filled with a feeling of family, discovery, friendliness — and definitely Star Wars. Going to the pool on the top deck was obviously a big draw; Jack would spend all day in the water if he could, a preference only compounded by the pool’s proximity to a massive screen playing Pixar and Disney movies. (Really, though, who wouldn’t want to watch Ratatouille on a sunny day, while in a pool on a cruise ship?) We took in the live, Broadway-style performance of Aladdin — Jack’s first time seeing a play or stage actors ever. He delighted in meeting Mickey, Donald, Goofy, Minnie, Daisy, and various Disney Princesses, either waiting in line or just having a chance encounter, which seemed even more special. Seeing how he and other kids react to these real-life versions of their animated heroes is enough to warm the heart of even the most Scrooge McDuck-like. 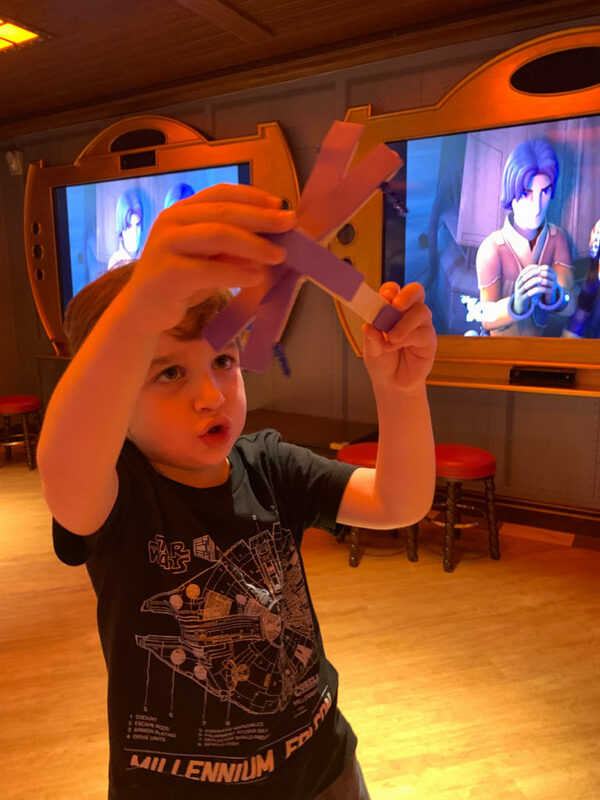 We spent some time together in Disney’s Oceaneer Club, a large activity center designed for kids ages 3 to 12, and it’s really kind of incredible. There are craft stations, an interactive floor, a section dubbed “Andy’s Room” based on Toy Story, and immersive experiences with tablets, and much more. 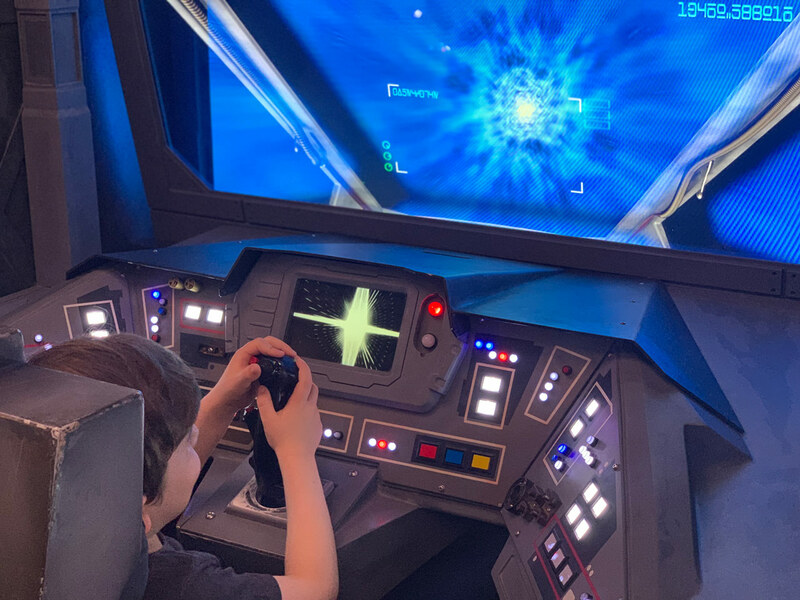 The highlight, for Jack and I, at least, is a stunning Star Wars area called Star Wars: Command Post, which looks like it was pulled right out of a Resistance base. It oozes detail, with weathered columns, exposed “wire,” and illuminated and interactive starmaps and interfaces, complete with clickable buttons. 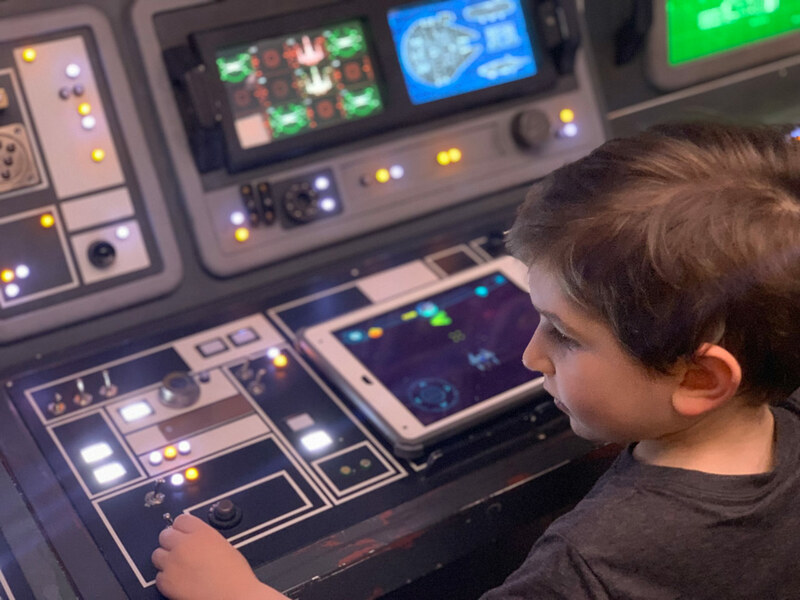 There’s a life-size, animated BB-8 that obeys the commands of Oceaneer instructors, as well as ship holograms that you can manually spin, and fantastic flight sims that are thrilling — they’re pulled straight from Star Tours — putting you in the cockpit of X-wings, Naboo starfighters, and more. “The great thing about all of our Star Wars programming in this space is that it’s ever-changing,” Alex Black, youth entertainment host at Star Wars: Command Post told me. “So every time a child or adult visits, the program might not be the same as it was beforehand.” I didn’t want to leave, never mind Jack. When we’d arrive at the various ports, we approached our excursions as mini day trips. You only have a certain amount of time before you have to get back to the ship, so we picked a simple activity and enjoyed ourselves. In Cozumel, Mexico, we walked around the markets of the local square, especially happy to pick up some charming $1 luchador toys; arriving in George Town, Grand Cayman, we made it a beach day; at Falmouth, Jamaica, we walked the port area and nearby neighborhood, and bought hand-made superhero toys and baskets. These little adventures made for an even more rewarding trip. Still, Star Wars was never far away. 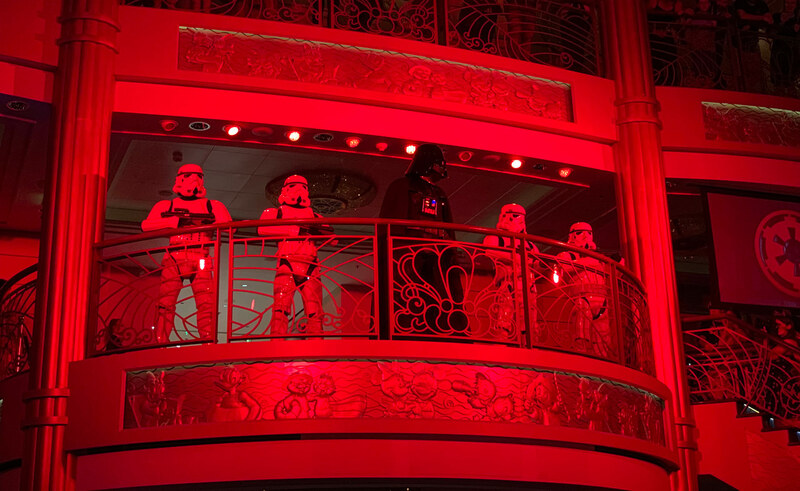 There are movie theaters aboard the Disney Fantasy, and each night would see a different Star Wars movie screened. Now, as I have two young kids, a 10 p.m. movie is officially Super Crazy Late for me. But I thought I should at least check out some of my favorite film of all time, The Empire Strikes Back, on the big screen, as a small appetizer to the main course of Star Wars Day at Sea. Maybe just five minutes, I said to myself. Then, maybe until the end of the Battle of Hoth. Then, Okay, I’m leaving after the asteroid field. Of course, two hours later as the credits began to roll, I got up out of my seat, exhilarated, and headed back to our cabin. Here’s a little-known secret: Star Wars Day at Sea really begins the night before. 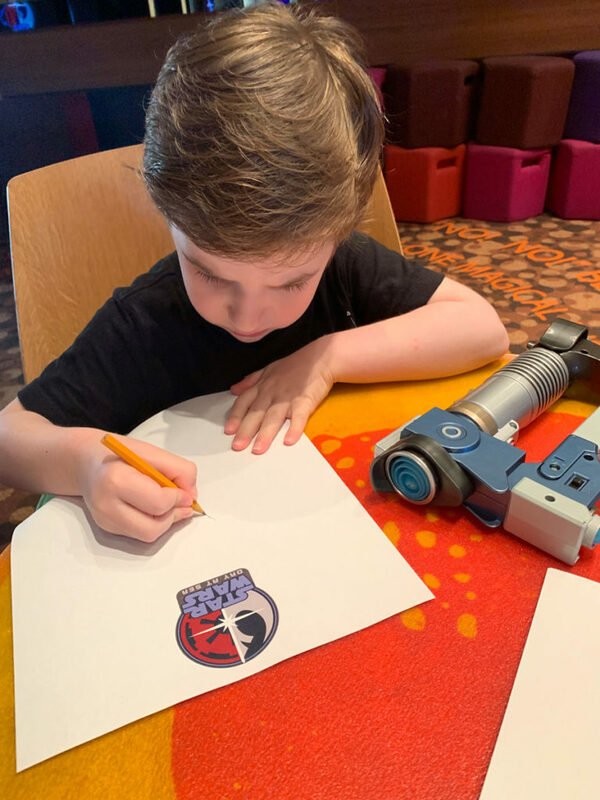 While most of the activities aboard the Disney Fantasy are timed and scheduled for all to see and plan around, the kickoff of Star Wars Day at Sea is something of an Easter egg. Thanks to a tip, I headed to the atrium just before 10 p.m. the evening before the big day. A musical act was playing, as they do every night, and a small crowd was gathering, including many in Star Wars attire. (As I’d find out, Star Wars fans who regularly attend Star Wars Day at Sea are in the know about this secret launch.) Then, it happened: when the clock struck 10, the band was cut off. The lights began flashing red, basking everything in crimson. The classic “Imperial March” began blaring gloriously over the ship’s sound system, and finally, Darth Vader himself appeared on the balcony, flanked by a squad of stormtroopers. 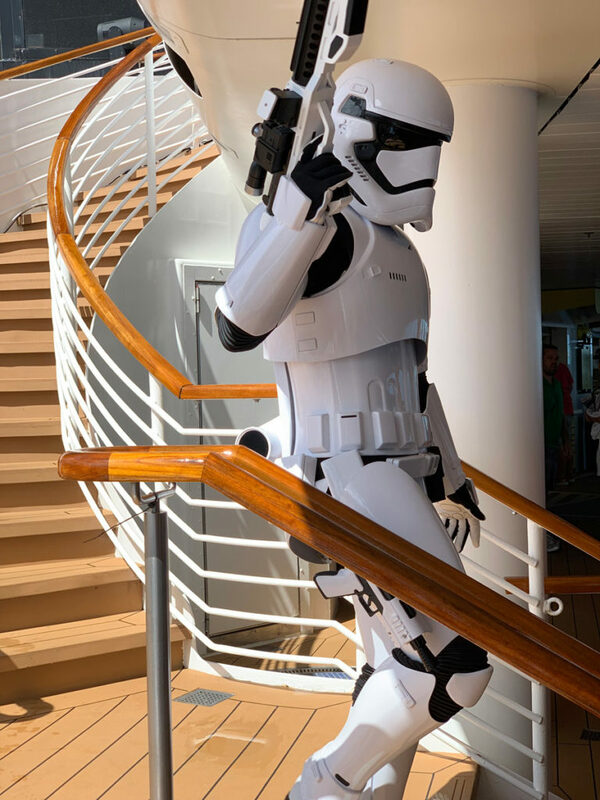 He was taking over the ship — indeed, his enforcers soon began scouring the crowd for rebel spies — and Star Wars Day at Sea was officially here. Smiles were everywhere. The next morning, we all donned Star Wars shirts (in Ben’s case, it was technically a onesie), had a quick breakfast and headed off for our first experience of the day: meeting the Sith Lord himself. While ominous music from Return of the Jedi played, Vader greeted us. “An unfortunate display of devotion to a lost cause,” he said upon seeing my rebel-centric shirt, which featured art from the Italian movie poster of Star Wars. We all gathered for a picture, Jack conveying a mixture of excitement and nervousness; after the photo, he began firing away with his lightsaber-blaster, saying to the villain, “Darth Vader, look what I have!” Maybe cuteness is the real way to defeat Darth Vader. We’d then go on to meet C-3PO and R2-D2 together, followed by Chewbacca. Jack showed off his Jedi weapon again and, appropriately, gave the towering Wookiee a hug. Jen and I loved watching every second. 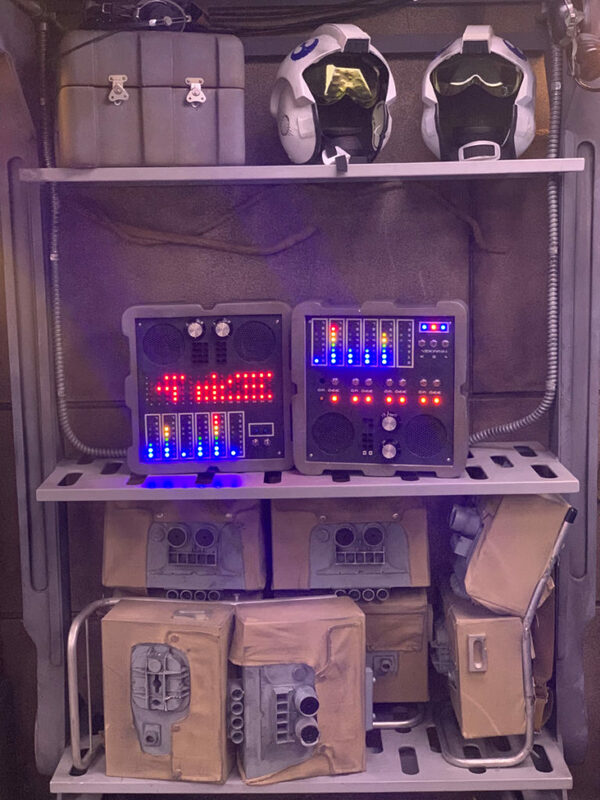 What’s especially fun about Star Wars Day at Sea, which I didn’t realize before experiencing it, is that the ship is truly immersed in Star Wars from morning until night. In all honesty, it almost feels like a day at Star Wars Celebration. There are fans in costume everywhere, Star Wars banners and decor, and aside from the character meet-and-greets, which are hugely popular, all kinds of Star Wars programming: an all-day “Porgs On Board!” scavenger hunt, Star Wars 101 for newbies, quote trivia for all ages in D Lounge, know-it-all trivia in O’Gills Pub, superfan trivia (which, toward the end, totally stumped me) in The Tube, artist Russell Walks appearing as a guest speaker, screenings of the entire prequel trilogy and Rogue One, character appearances and interactions on the pool deck, and on. 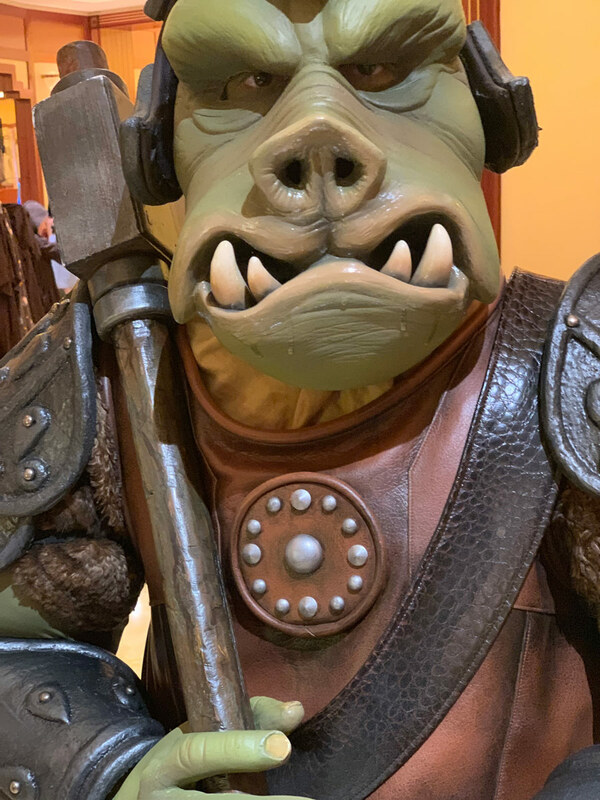 Jawas would randomly approach people, looking to trade something, Gamorrean Guards would randomly walk the decks, and First Order officers would stop for photos, even though they had a distaste for all things Resistance. 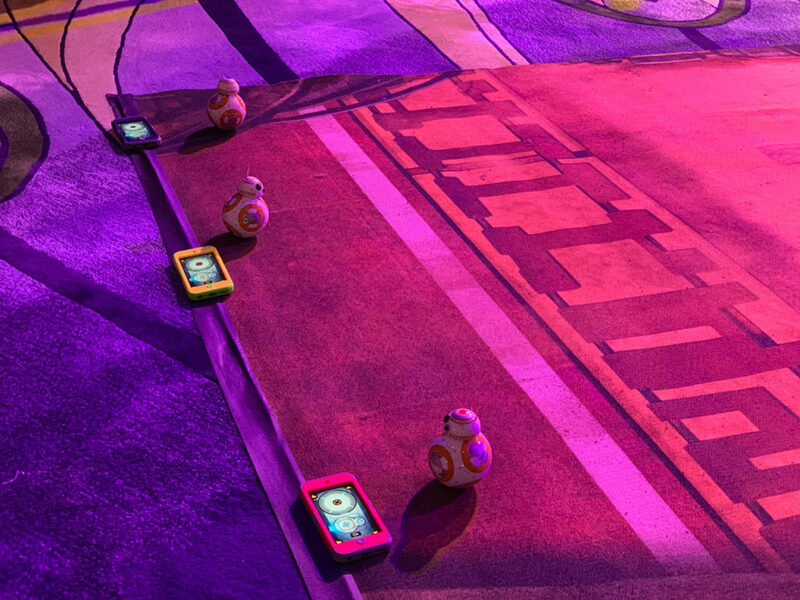 BB-8 races, in which fans race Sphero’s App-Enabled Droids, drew huge crowds, oohing and ahh-ing and cheering throughout. “Everything we do is put together with Lucasfilm,” Peter Hofer, cruise director, told me, explaining the authenticity of it all. Many people I spoke with said they picked this cruise because they were Star Wars fans, and it’s easy to see why. But it was really important for me to experience this day with my family and with Jack, especially, so I picked activities that I thought would suit us. We went to the Star Wars Drawing Academy, in which everyone was given paper and pencils. We would be learning how to draw a porg via a video, hosted by a Disney animator. It was an interesting experience for me as a dad; initially, I tried to help Jack follow along to the instructions, while I also drew my own version of the famous Ahch-To creature. But eventually I just acquiesced and let Jack do his own thing. He paid attention to the video himself, and while he couldn’t match the exact example of the porg, I watched as he learned and illustrated in ways he never had before. When the instructor talked about drawing the body, he did so. He drew facial features. He drew little porg feet. He drew a lot. By the end of the class, everyone had drawn one giant porg; Jack drew a family. I was really proud. Later, we went to Disney’s Oceaneer Club for some Star Wars crafting, specifically ships and vehicles. We decided to make an X-wing — under the guidance of a youth entertainment host’s instructions, thankfully, because I would’ve had no real idea of what I was doing. It was simple enough that both Jack and I could play a part; I set up the frame of the ship, Jack picked the purple foam tape and applied it. When it was complete, he instantly started flying his starfighter around the room, clearly excited that this ship was something he created. Then, it was on to dinner. Our last real Star Wars activity as a family for the day, dinner was Star Wars-themed in ways both subtle and overt, and always fun. 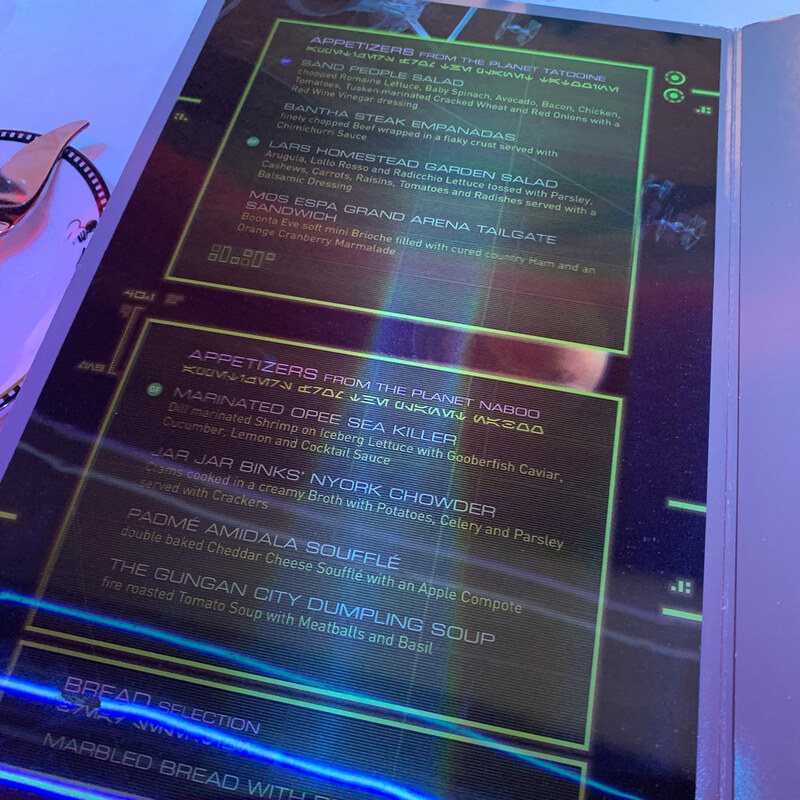 The menu looked like a datapad, with a super-cool lenticular effect and written partially in Aurebesh, featuring meals inspired by locations (and characters and creatures therein) from the saga. There were “Bantha Steak Empanadas” (made with finely chopped beef), “Marinated Opee Sea Killer” (dill-marinated shrimp on iceberg lettuce with gooberfish caviar, cucumber, lemon, and cocktail sauce), and “Lord Vader’s Nerf Steak” (a rib-eye), to name but a few. The kids menu doubled as a Chewbacca mask. 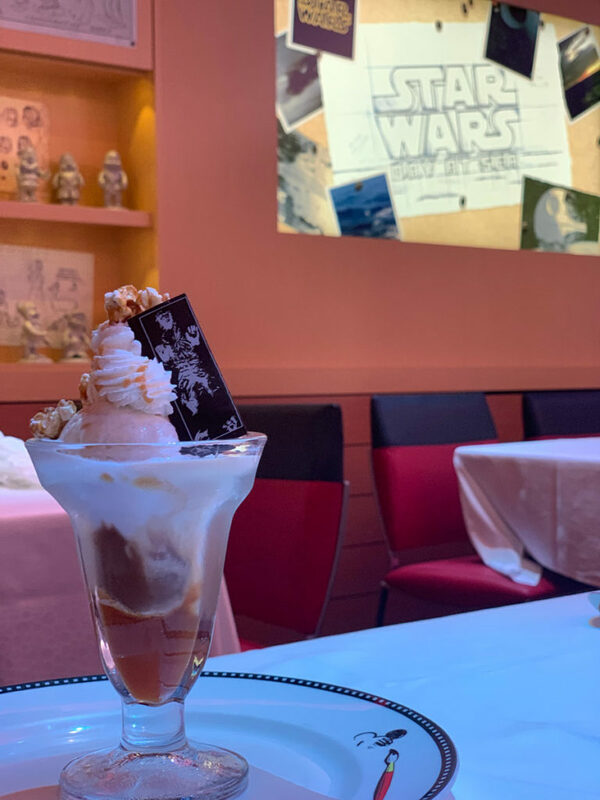 For dessert, I’d heartily recommend Han Solo’s Frozen Carbonite Sundae. The day closed with Star Wars: Summon the Force, a huge gathering on the top deck that included hundreds of fans, characters from across the saga, and finally, a beautiful fireworks display to the sounds of John Williams’ score. I couldn’t think of a better ending. The last day of our journey, following Star Wars Day at Sea, was spent at Castaway Cay, Disney’s private island. It was a relaxing, beautiful, and gloriously BBQ-filled way to complete a trip that we will not forget. Though the cold rain that awaited us in San Francisco was certainly a sign that we were back to reality. Since we’ve been back, I’ve been thinking more about our time on the Disney Fantasy and how I relate to Star Wars now, after this trip. We go on vacations with family, and we take joy in sharing the things we love, like Star Wars, because of the connections they form between us and the ones we love. A meal here, a smile there, a laugh, a good conversation. 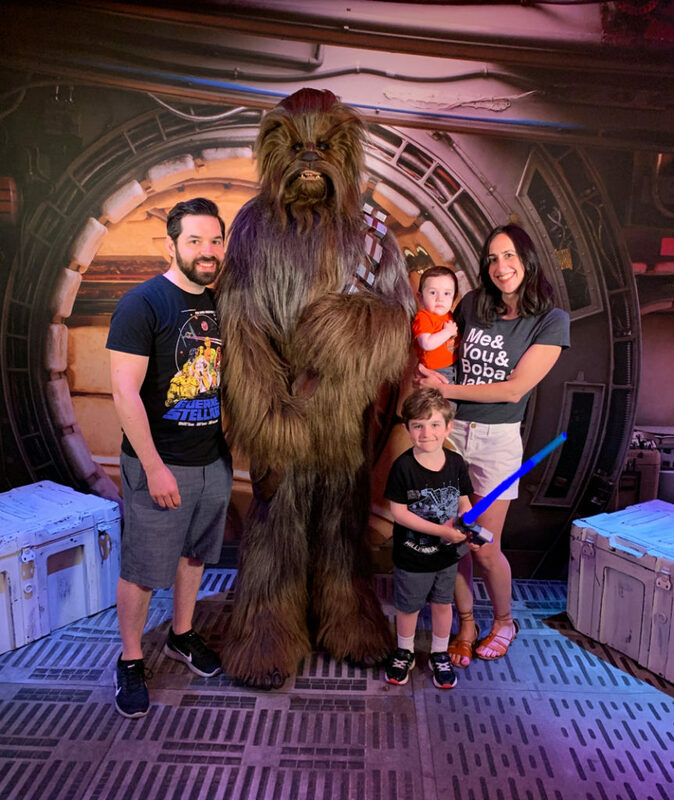 So for us to have our first vacation include Star Wars, and give us memories around it, is just incredibly meaningful for not just me, but all of us. The proof? The week we returned, Jack’s daycare had “Share Day,” in which students bring in something for show and tell. Jack didn’t bring in his usual toy or stuffed animal. He brought in his handmade X-wing. Visit the official Disney Cruise Line site for more on Disney Cruises and Star Wars Day at Sea.